We are pleased to announce the publication of a new paper by Matthew Kotchen, Zachary Turk, and Anthony Leiserowitz: Public willingness to pay for a U.S. carbon tax and preferences for spending the revenue in the journal Environmental Research Letters. Earlier this year, several prominent Republicans, including James Baker III (former Secretary of State, Treasury, and two-time White House Chief of Staff under Presidents Reagan and George H.W. Bush), George Schultz (former Secretary of State and Treasury under President Reagan), and Henry Paulson Jr. (former Secretary of Treasury under President George W. Bush), called for a national carbon tax with all revenues returned to taxpayers as dividends. 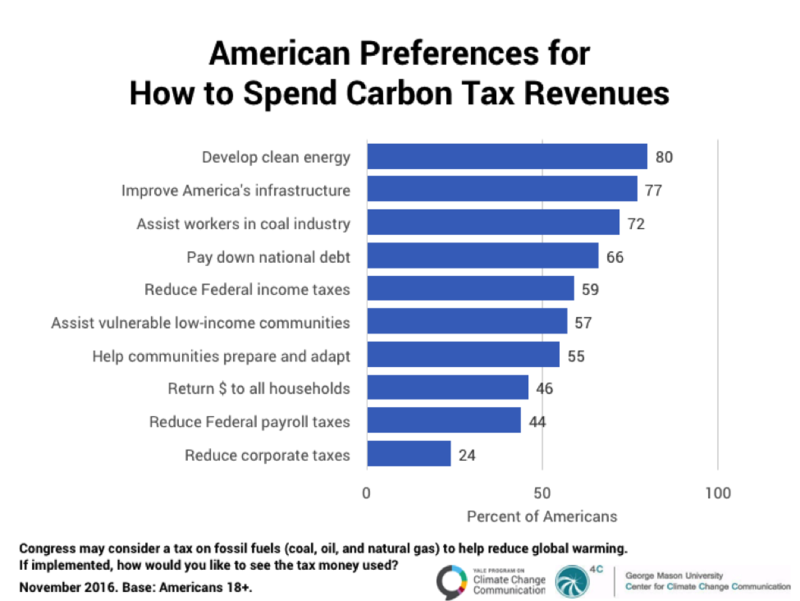 Just a few months earlier, using a nationally representative survey, we asked Americans if they would support a carbon tax, how much they would be willing to pay, and how they would prefer the revenues be spent. Respondents were asked: “If a tax on fossil fuels (coal, oil, and natural gas) to help reduce global warming were to cost your household $X more each year in higher energy bills, would you support or oppose it?” Respondents were randomly assigned a cost ranging from $5 to $155. We found that the average American is willing to pay $177 per year. Translating this to respondents’ energy bills based on their state of residence, we found that American households are, on average, willing to pay 14.4% more for energy in support of a carbon tax. This willingness to pay $177 a year on household energy bills implies annual tax revenue of about $22.3 billion, which does not include revenue from a carbon tax levied on all other goods and services in the economy. Respondents were also asked: “Congress may consider a tax on fossil fuels (coal, oil, and natural gas) to help reduce global warming. If implemented, how would you like to see the tax money used?” Respondents were given a list of 10 options, including reducing various taxes, paying down the national debt, returning the money to all American households equally, assisting workers in the coal industry who might lose their jobs, supporting development of clean energy, funding improvements to the nation’s infrastructure, and helping communities prepare for and adapt to global warming. There are currently about 15,900 employees working in extraction roles in the US coal mining sector, with an average wage of $51,640. Many would require retraining to transition to jobs in other sectors if the nation stopped using coal. The study found that the average willingness to pay for a carbon tax, combined with public preferences about how to spend the revenues, indicates a public willingness to allocate $2.3 billion per year to support coal miners. This is enough to compensate all coal miners with nearly $146,000 a year in the extreme (and highly unlikely) case that the entire industry shut down. At the least, this analysis indicates strong public support for compensating coal miners who might lose their jobs as part of the nation’s transition to a clean energy system. There are many other interesting findings in the article, which is available for download here.